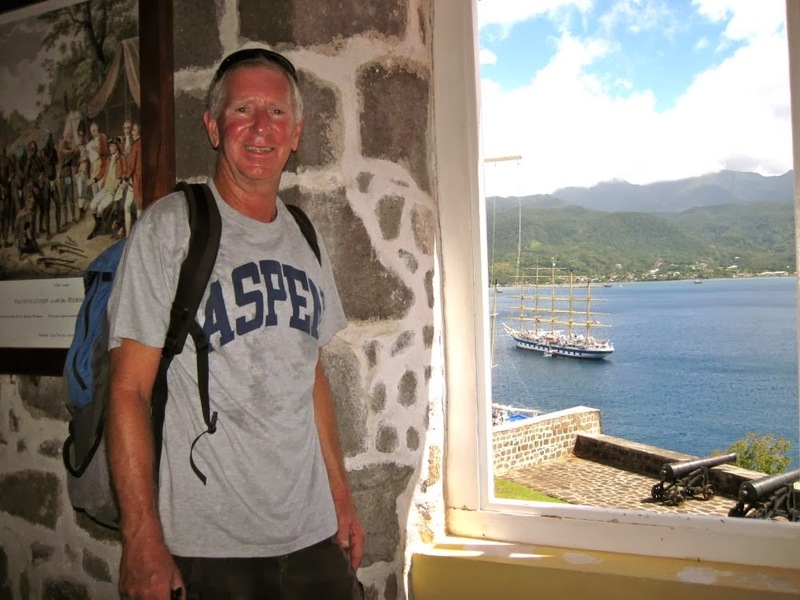 Follow the voyage of Steve and Maria aboard their sailing yacht Aspen as they sail around the world - from the volcanic rocks in the Caribbean and back again! 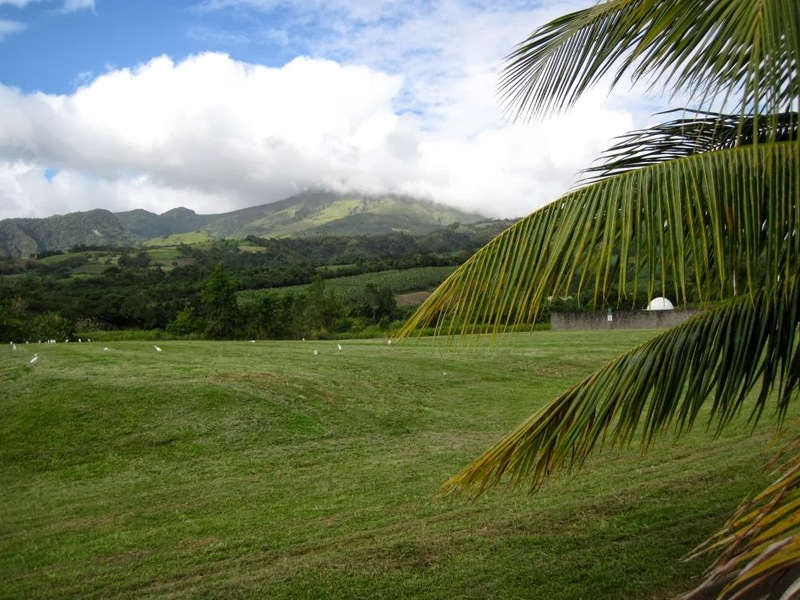 Mount Pele, Martinique. Where we gonna go when da volcano blow??? 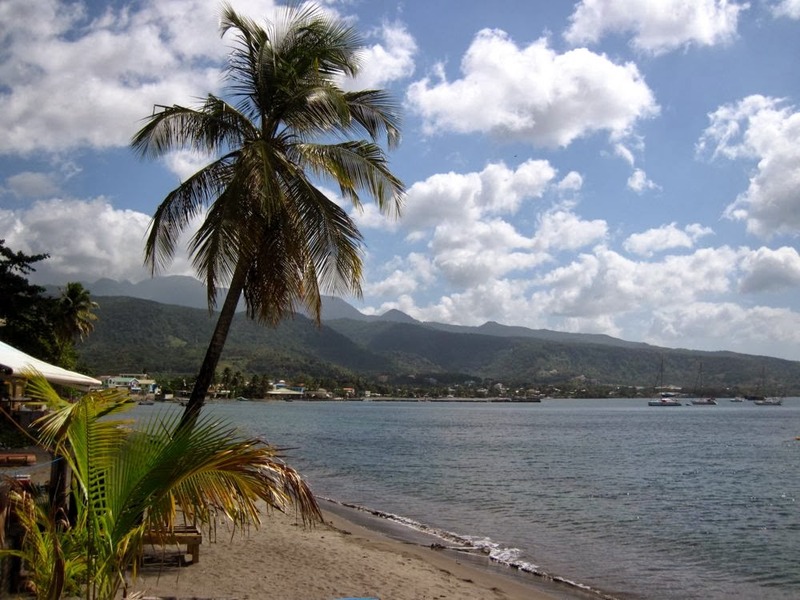 Prince Rupert Bay, Dominica. This is our anchorage! Lush stands of banana trees grow everywhere. 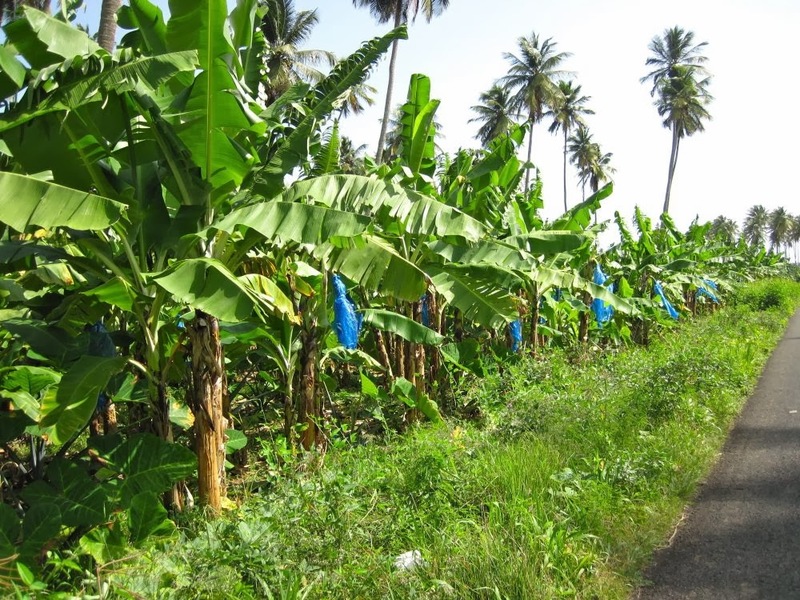 The blue bags are wrapped around the ready to pick bananas. 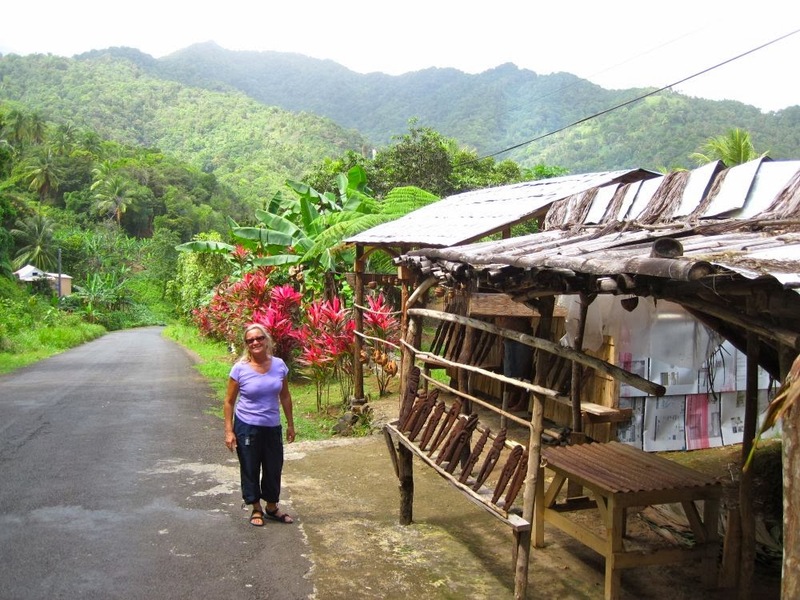 Maria shopping on the Carib Indian reservation on the windward side of Dominica. 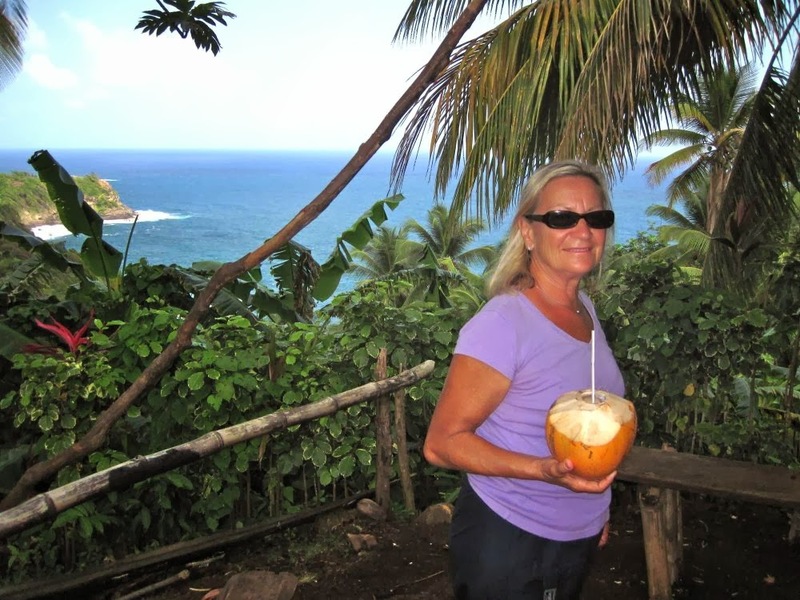 A spectacular view on Dominica with fresh coconut water of course! 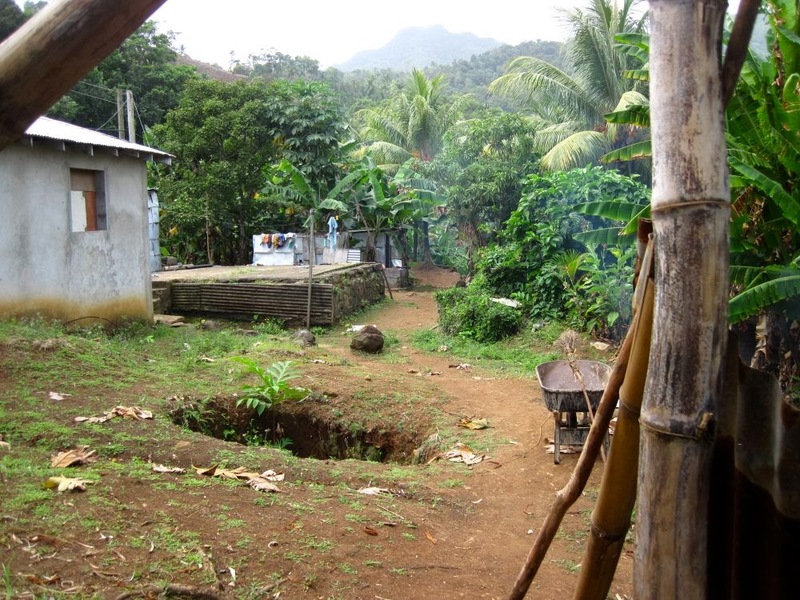 Typical Carib Indian house and land. Everything grows on Dominica. 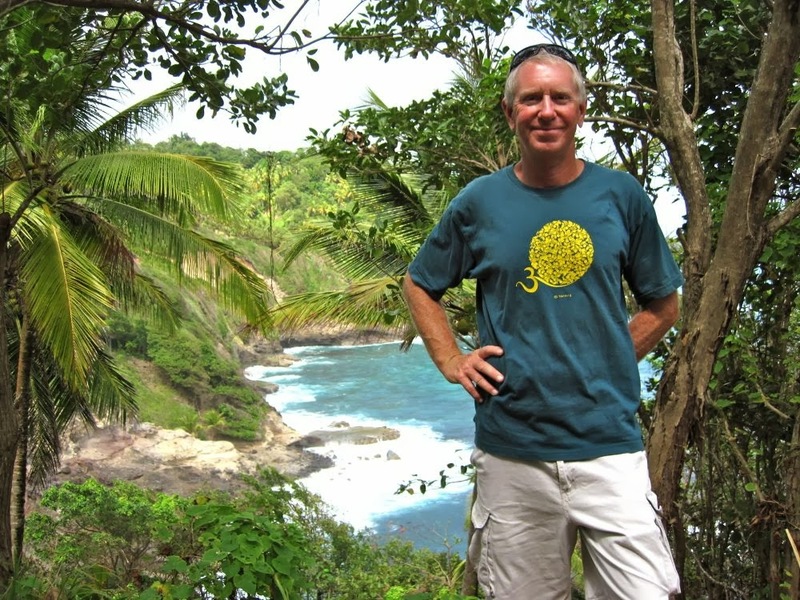 Enjoying another view on the windward side of Dominica. 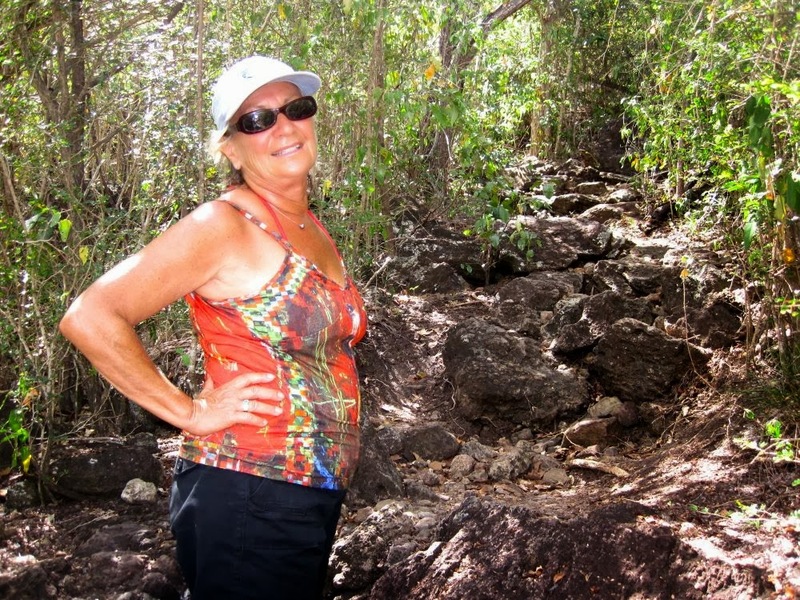 The beaches here tend to be black sand because the island is known more for the hiking and natural settings. Symbols erected for a long dead Carib chief. 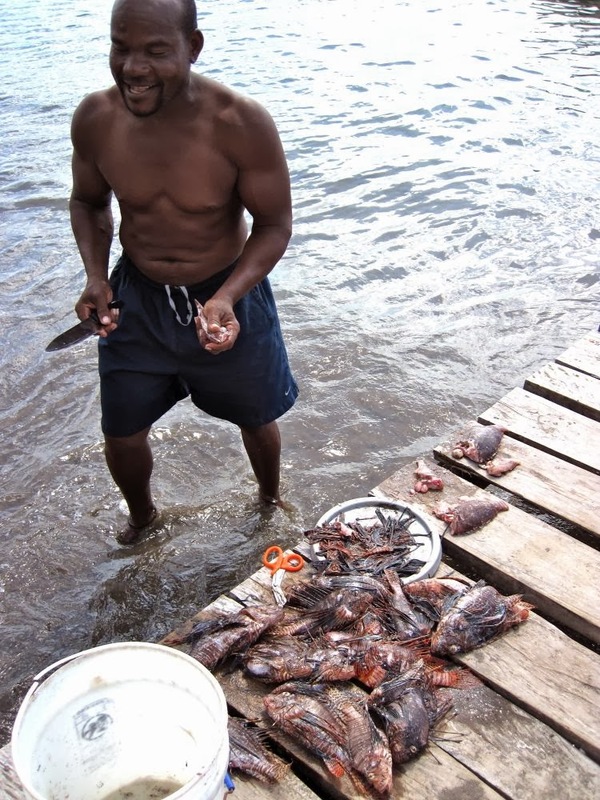 A healthy catch of Lion Fish - and what a feast it will be! The volcanic Cabrits in the background with Fort Shirley in the saddle between the peaks. 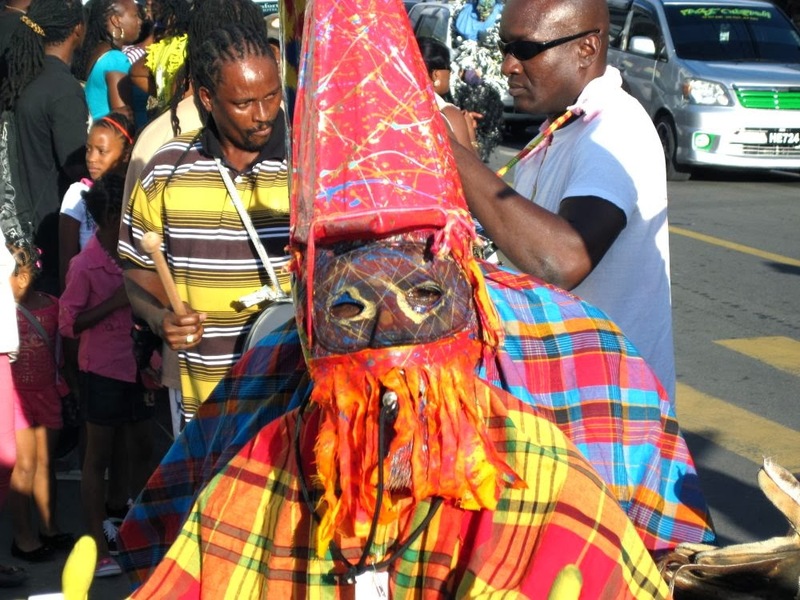 Carnival in Portsmouth, Dominica. The local beer is very refreshing! 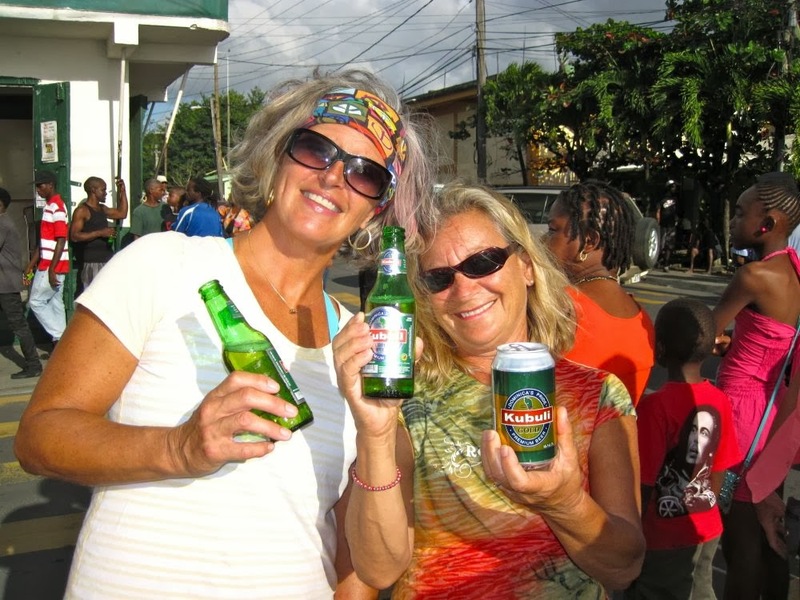 Maria and Paula, another sailor from Massachusetts, seem to be enjoying themselves. One of the many colorful costumes from Carnival. The view from Fort Shirley in the Cabrits of our anchorage. 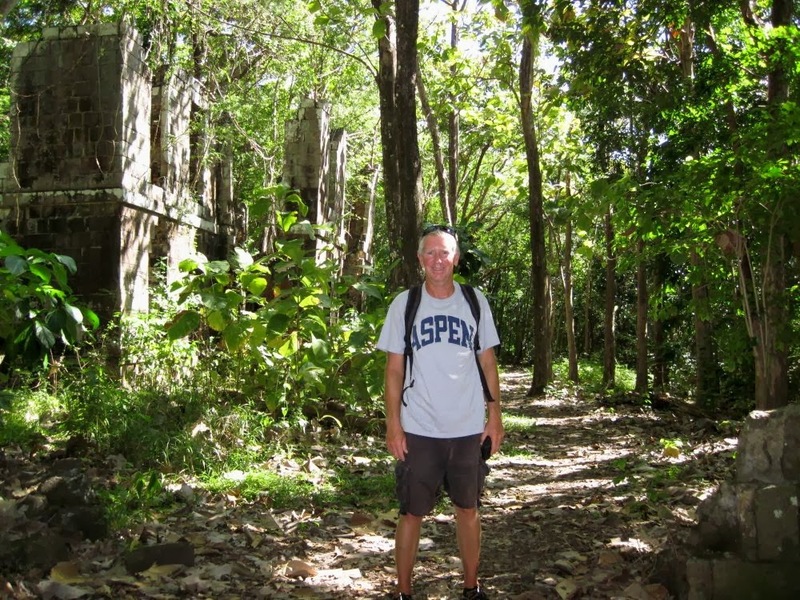 Fort Shirley, Prince Rupert Bay, Dominica. 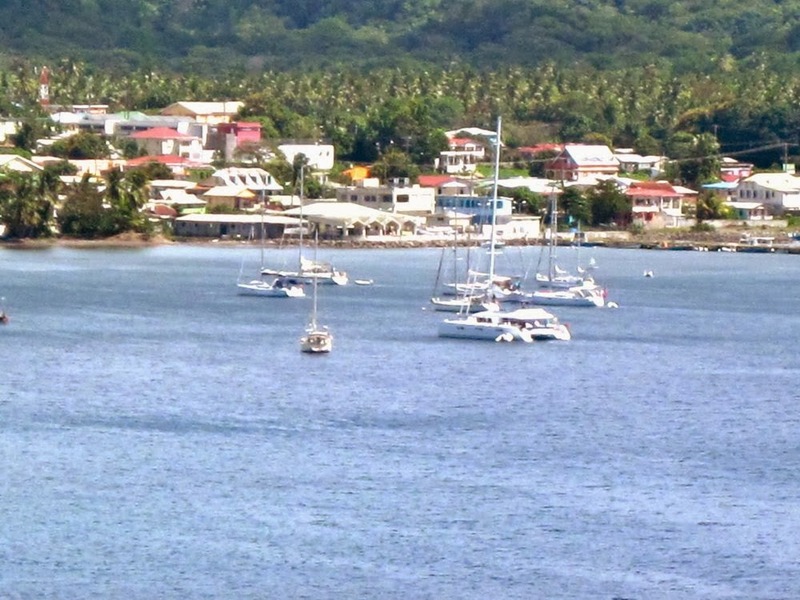 The town of Portsmouth, Dominica lies behind the anchored sailboats. 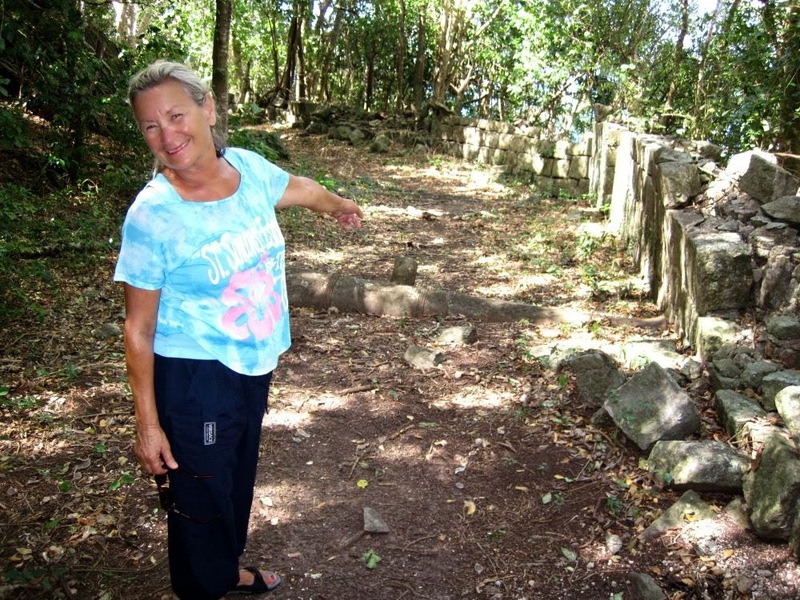 An example of the trails in Dominica. Yes that is a cannon in the middle of the trail! The jungle holds so many surprises around every corner! A tender to a sailing ship and the beach landing the passengers must endure. There are no docks here for them! 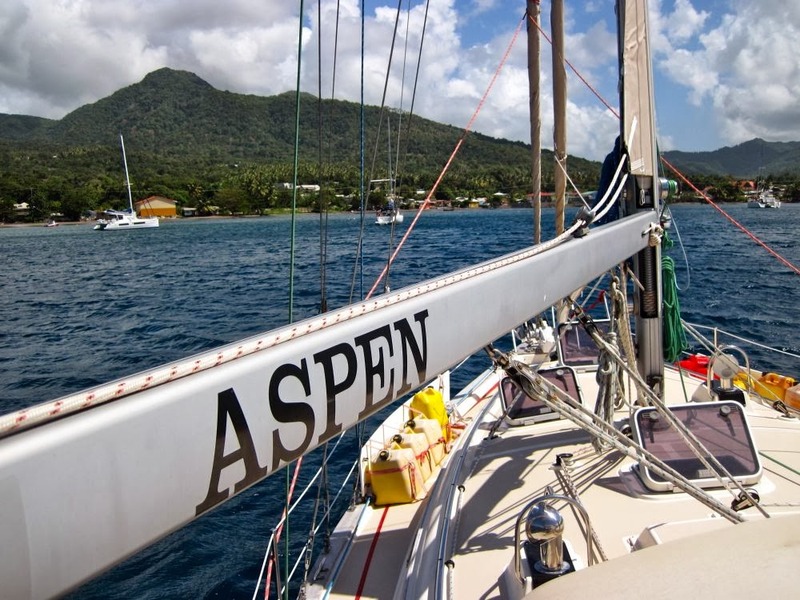 Aspen is anchored beneath the volcanic Cabrits at the north end of Dominica. The French, British and Spanish fought over Dominica from the 1500's until Napoleon met his defeat at Waterloo and the Caribbean became quiet once again. 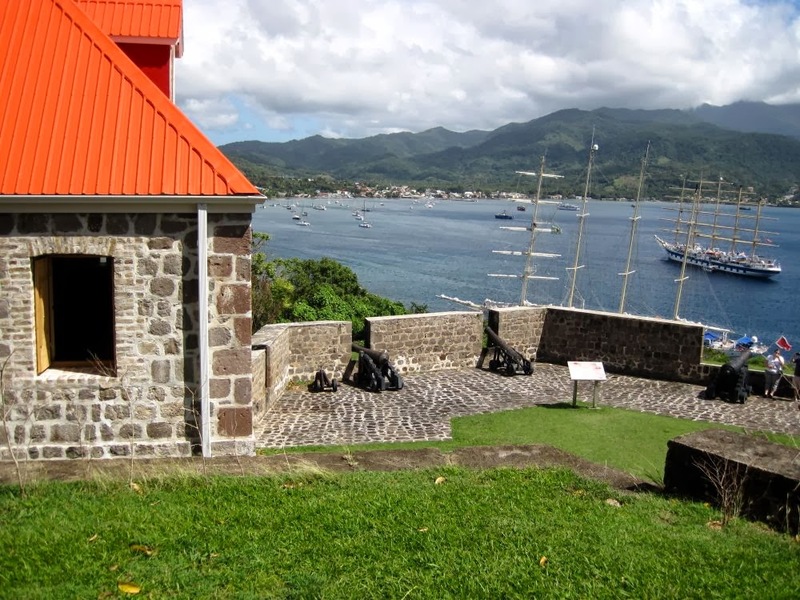 After Napoleon was gone Dominica became part of the past British Empire. Then in the 1970's Dominica broke away from that crumbling empire and became independent, as it remains today. The ghosts that seem to roam the abandoned Fort Shirley, built between the peaks of the Cabrits, seem quite happy sipping their rum and watching the sun slowly set into the Caribbean Sea alongside our beautiful anchorage. Long gone but not forgotten is the legendary Battle of the Saints, just offshore from our peaceful anchorage, where Rodney and his small group of British ships out sailed the French in a spectacular victory to take control of this part of the Caribbean Island chain. 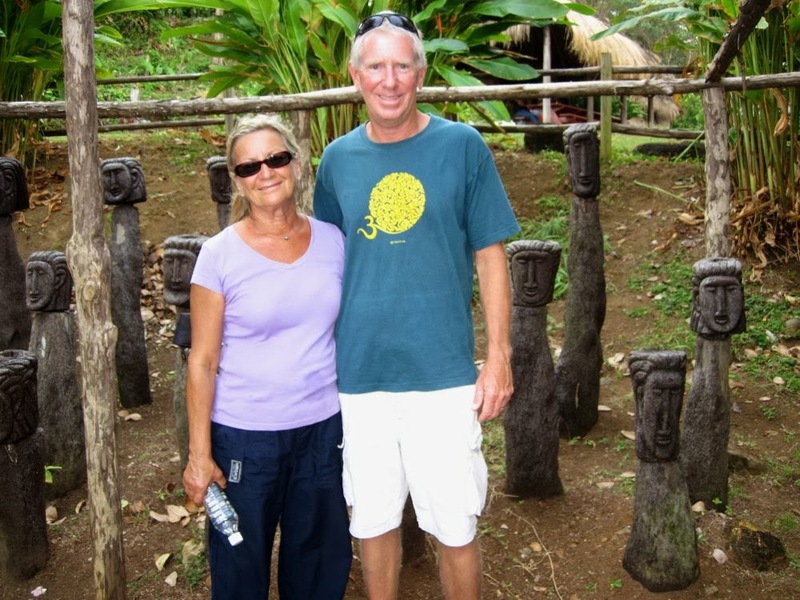 The hiking on Dominica is as good as it gets with a continuous trail system that traverses the entire island from the south end, amongst the high volcanos and boiling lakes, to where we are on the north end in Portsmouth at Prince Rupert Bay. Since gaining independence from Britian, Dominica has become very a basic island with little income to run their economy. 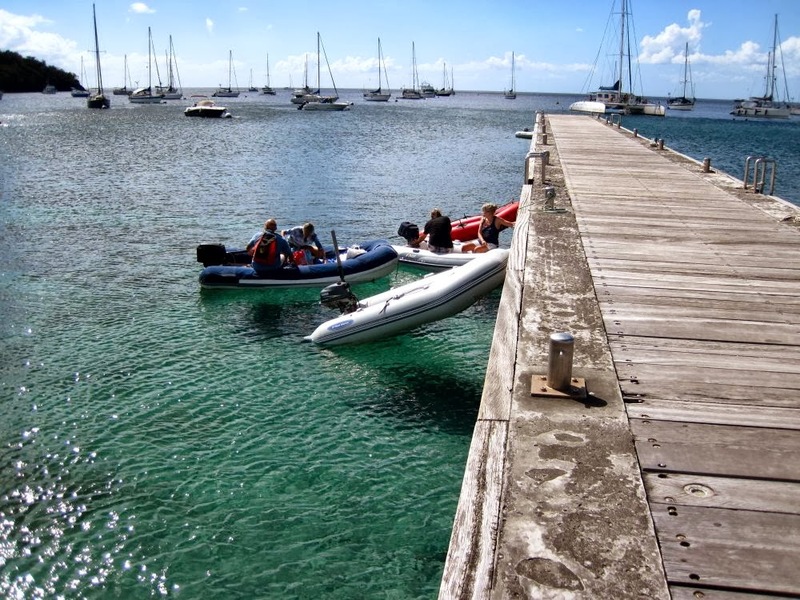 It is the poorest island in the Eastern Caribbean yet rich beyond sheer money. That said, there are no friendlier people that we have met than these on Dominica. When was the last time someone ran across the street to shake your hand to say thank you for visiting? Walking down the street the litany of good morning echoes everywhere and to everyone who passes by. The fierce Carib Indians have a reservation on the windward side of the island where the remaining indigenous people live. Today they build canoes, weave baskets and fish in the wild seas. No more eating people or so it seems! 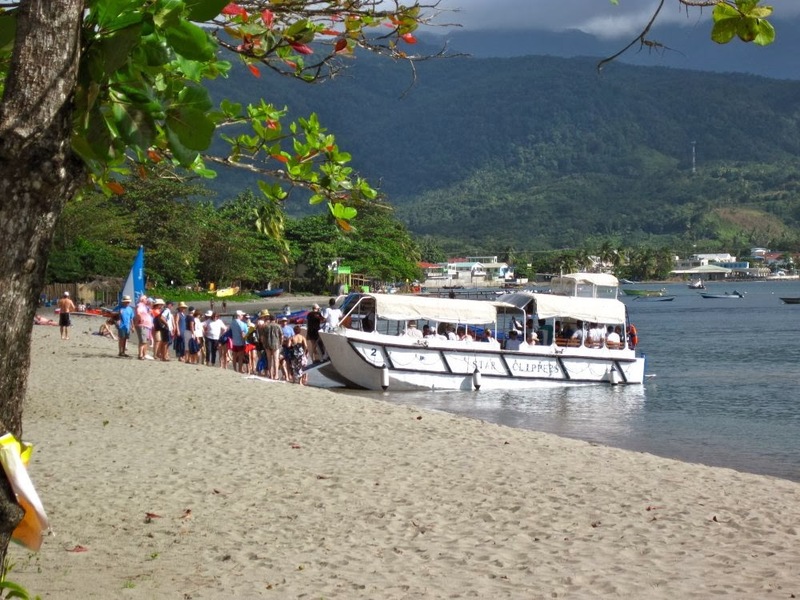 Columbus would still recognize Dominica if he sailed by here, that is how little it has changed in 500 years! 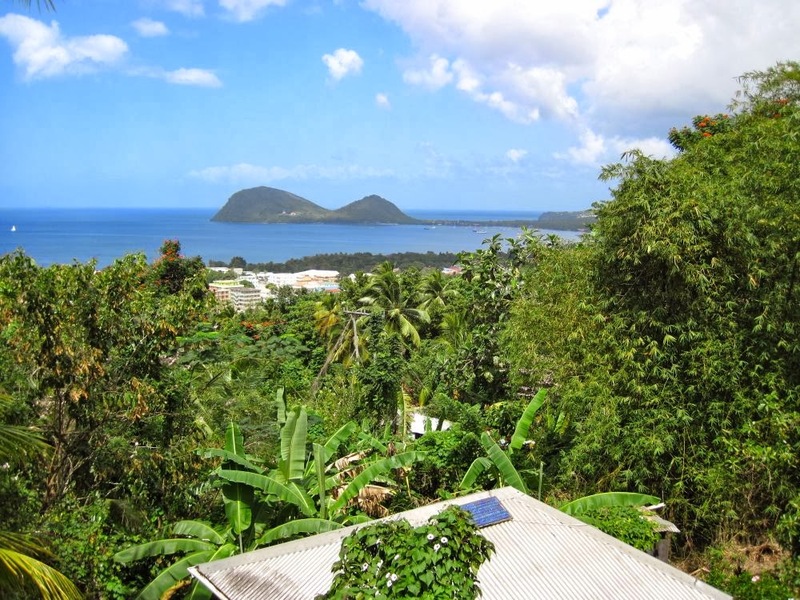 We will leave lovely Dominica for Guadeloupe within the week, sailing further to the north, visiting more French and formerly British islands along the way. 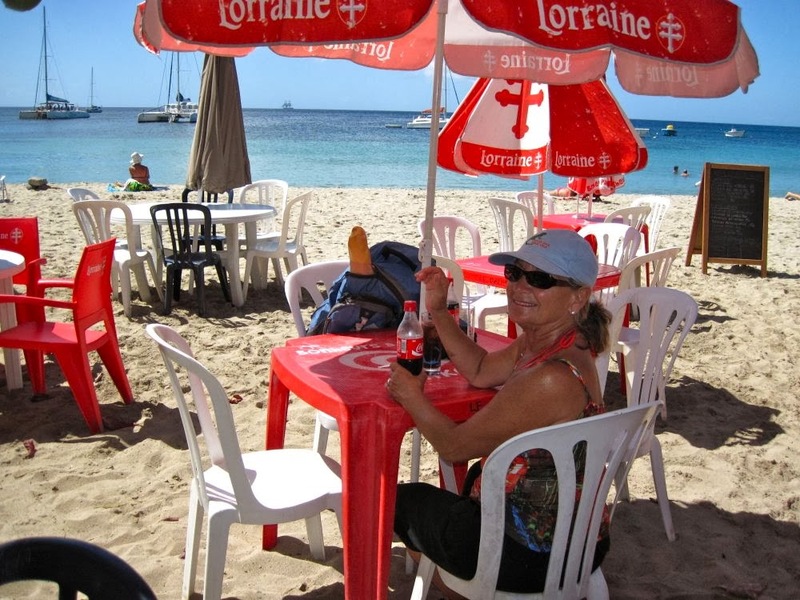 A boat, a beach, French food and warm weather - it doesn't get much better than this! A nice rocky hike on Martinique! A big dinghy dock but there are tides to deal with! Ahhh the Caribbean! 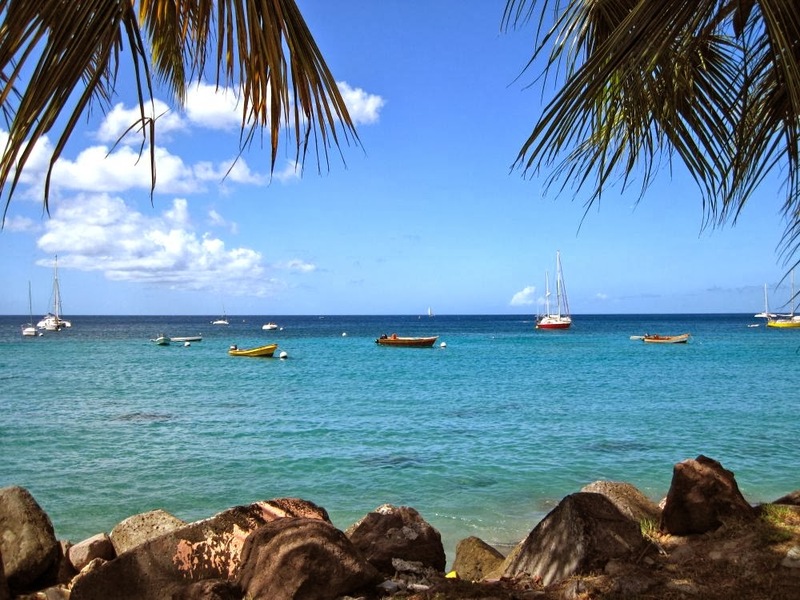 Martinique, very French with sparkling clear water and oui the food! 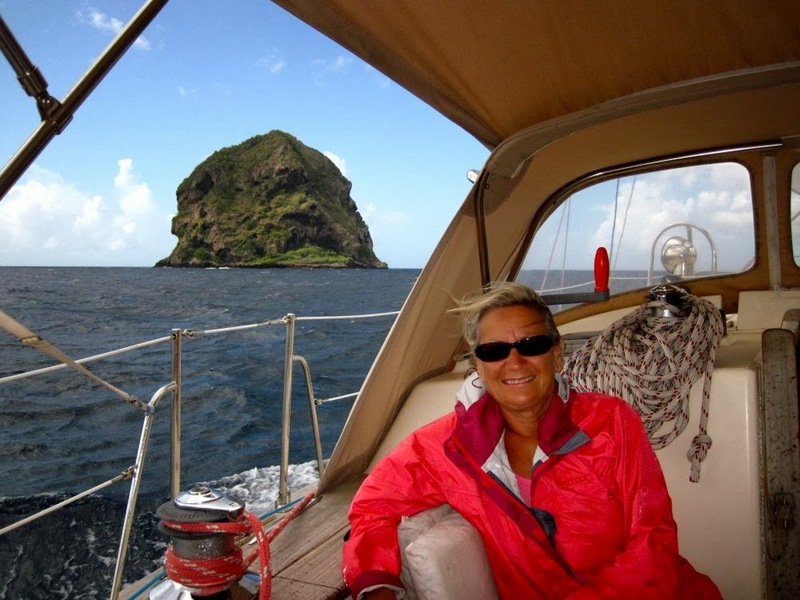 Sailing from St. Lucia to Martinique was a 4 hour sail; just 4 hours? That's right, no overnight passage but just a rocking and rolling time in the winter trade winds in these little latitudes. Yesterday we did a 4 mile hike from Grand Anse D'Arlett to Anse D'Arlett and back, where we are anchored. Going there was easy because it was on the road. Then Captain Steve decided to take the trail back to Aspen and it turned into one of those rocky, scrambling, hot and not so pleasant trails. Luckily Maria had proper sandals on while Steve, well, bare feet would have been the same as his sandals. Yet we survived and had a nice lunch on the beach to make up for all our activity! We found out the there is a strike going on here. The strike means that there is no gasoline being delivered and the cars are starting to sit idly on the streets. Of course our dinghy needs gasoline so pretty soon we may find ourselves swimming ashore if nothing returns to normal. Normal is not in their vocabulary here so we will probably have to just go to another island and country to find gasoline! Geeze. We plan to slowly head further north when the winds and seas tell us to leave. But for now we will enjoy the pate, baguettes, and French beaches all around us. What fun!